It's always worth double-checking in this excellent strategy game. Frozen Synapse 2 has plenty to offer with its campaign, but again, this sequel is at its best when playing against other fallible humans. What is it? A turn-based tactical game about SWAT teams from the future. 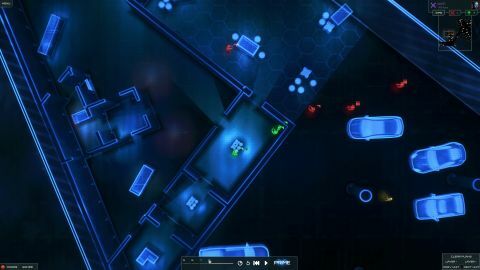 Most of the action in Frozen Synapse 2 plays out in these perfect five-second bursts, as your soldiers carry out their orders with nothing less than complete precision. It's a wonderful thing to watch, at least when things are going right. Your team might breach a room from multiple entrances within the same millisecond, or duck behind cover just as the grenade that would have killed them explodes harmlessly on the other side. It's flawless and meant to be enjoyed, because those moments likely took plenty of planning on your part. Just like its predecessor, this is a game fueled by intense simulation. You may not know exactly what your opponent plans to do next, but you can keep running tests until you have a pretty firm idea. Let's say you find yourself controlling a soldier armed with an assault rifle facing an enemy unit holding a shotgun. Between these two units lies some basic cover. Should you tell your soldier to stand their ground and take a shot, or move to the cover and then open fire? Which is the safer option? What happens in either case? Unlike most turn-based tactical games, in Frozen Synapse 2, you don't need to guess. Instead, you run a test scenario for each decision. This means not only simulating your soldier's actions for the next five seconds, but also those of your opponent. You can confirm what will happen if both units hold their ground, or maybe what happens if one, or both of them run for cover instead. In the singleplayer campaign, this often comes down to logic. The computer AI is certainly challenging, but I rarely found it truly surprising. Its response to player action is usually an aggressive one, although it tends to avoid most unnecessary risks. This makes it reasonably predictable to face, although in most cases that's countered by the fact that it'll bring a lot more firepower to the battlefield. However, playing against other human beings can be anything but predictable. This is where the game truly grabbed me. I'm reminded here of why I don't enjoy playing chess against a computer, but love playing in-person: the best move is often the one that surprises your opponent the most. If you think back to the example setup I mentioned with the two soldiers facing each other, things change when another player is added to the mix. It prompts a third, vitally important question: 'what do they think I'm going to do next and how can I take advantage of that assumption?' It's these questions that made the original Frozen Synapse such a delight to play back in 2011 and they're still just as enticing in its sequel. The major difference here is that there's a much bigger playground for them. The campaign is heavily inspired by X-COM: Apocalypse (which is no bad thing), and features a procedurally-generated city for the player to scheme and fight over alongside several other factions. Each of these groups has a different agenda, which sees them clashing at times, although all of them are equally interested in the 'relics' you've been collecting as you defend the city from an invading force. There's so much room for experimentation here. Do you want to maintain a good relationship with the more powerful faction? You don't have to. From the very start of the game, you can choose to attack any building in the city, for whatever reason, no matter who owns it. If your attack is a successful one, you can then steal whatever was stored there. Be warned, other groups may choose to do the same to you. Each of these structures is itself a unique map for you to fight on and the forces you'll encounter will depend on what squads have been housed there by the other factions. These squads move around in real-time between fights and have their own operations to complete around the city. This campaign is just full of systems to dig your teeth into. Although it was the game's multiplayer that I was drawn to, if you enjoyed the campaign from the original game, there's a lot more going on this time around. I doubt you'll be disappointed. Frozen Synapse 2 is not a game of dice rolls or chance. Luck isn't meant to be much of a factor. It's about running the very same simulations your opponent is probably running too and then trying to get inside their head and figure out what they'll do with that information. Just like in chess, it's about seeing a good move and then looking for a better one.